We’d love your help. Let us know what’s wrong with this preview of The Luck Uglies by Paul Durham. Strange things are happening in Village Drowning, and a terrifying encounter has Rye O'Chanter convinced that the monstrous, supposedly extinct Bog Noblins have retur The Luck Uglies is the first in a tween fantasy-adventure trilogy brimming with legends come to life, a charming wit, and a fantastic cast of characters-and is imbued throughout with the magic of storytelling. To ask other readers questions about The Luck Uglies, please sign up. Hello :) What was your favourite part of the Luck Uglies, by Paul Durham (if you've read it!) ??? Séamus Fanning When Harry catches the snitch! Hi, Is this a good book for YA readers? Maria Tag Yes! I really recommend it. I don’t often open reviews with the first line, but in this case, I think it’s my favorite first line of the year so far. First lines are like the first bite of food in a meal. They give you an instant impression of what the book will be like, sound like and feel like. While a great first line does guarantee a great book, a good first line can be quite a boon to a book. The moment I read this line I found myself relaxing into the story, recognizing I was in for a fun and furious ride. The Luck Uglies is a fantastic adventure of urban fantasy for middle grade readers that welcomes its audience in and brings readers along the rooftops and down into the tunnels and everywhere in between. Delicious, filling, and has got me asking for seconds! Rye O’Chanter and her family live in the town of Drowning, a placed ruled by the oppressive and petty Earl Longchance. Rye’s nature is such that she cares nothing for the Earl’s laws (such as the one about women not reading) and is more than willing to break such rules–especially when there’s a chance to read a book that the Earl has banned. But now trouble has come back to Drowning. Monsters known as Bog Noblins have returned to the town, and pose a danger to everyone. Rye knows only the legendary Luck Uglies can defeat these monsters–but even if she finds this notorious secret society, will they help Drowning this time? Sometimes names in a book are simply there and the readers won’t particularly note or notice them. Other times the names clash or wind up feeling inappropriate for the character or book. In rare instances, a book can take the names and run with them. Paul Durham’s book manages to succeed with names on a level I’ve only seen with a few other authors–including my personal favorite, Terry Pratchett. Let me just list a few of the names for characters and places you’ll find in the book: Morningwig Long Chance, The Dead Fish Inn, Bog Noblins, Rye O’Chanter, Harmless, Folly Flood. In another book, the names would feel out of place, oddly comical. Here they fit and light up the text, giving it character and a sense of earthy whimsy. For a debut story this is great stuff. Heck, it’s great stuff no matter what. Vividly drawn characters and a setting that is as much a character in its own right. Interestingly, this is also a family story of sorts. Granted, Rye’s family is a very odd one indeed, but that just makes it more of a reading adventure. In some ways this tale remains fairly straight forward, our worst villain is obvious from the start–there’s no gray area when it comes to Earl Longchance, he’s as nasty as Prince Humperdink. While I think the adventure and fun of the tale are firmly middle grade, there is some rather startling violence in the story. (for instance, a man getting his arm bitten off) that might be a bit much for some readers. Despite the light-hearted feel of the story there is still some truly frightening stuff going on. For all that, it’s going to be the characters that win out for me. Especially Rye’s toddler sister, Lottie who seems to have a dangerous love of swords and pointy objects. This story is presented up front as the first in a trilogy and I for one will be looking forward to the next volume! The Luck Uglies was a fantabulous novel and while I absolutely adored it and probably even loved it, I cannot bring myself to give it more stars for the reason that at times, it was BORING. And the fact it was boring was not really the book’s fault. A weird thing to say, right? I’ll come back to this. The Drowning Village is currently ruled by Earl Longchance, who quite simply put... is a douchebag. He has rules that make it hard for women to become educated even though elsewhere in the world (this book is set in) women have those freedoms. He’s also more about the money than he is about actually helping the villagers out but most of them don’t mind all of this because their fear of the Bog Noblins. The world building in this book is fantastic. The author paints this world that I can imagine so vividly. I can imagine myself trying to jump over the rooftops, I can imagine myself trying to hide in the secret tunnel, I can imagine myself roaming around the village and I can even imagine the forest with all of its secrets. Quinn is a character that is quite easy to adore but her friends on the other hand, not so much. It’s not that her friends aren't great, it’s just that I don’t think we were around them enough for me to develop any sort of fondness for them. Harmless on the other hand though. He is so bloody charmastic. I really just wanted to tackle hug him half the time. And his name isn’t actually Harmless, you should know that but you’ll find the story behind that one humorous. Getting back to what I mentioned in the beginning, I think it was the 3rd person narrative that ended up causing problems for me. It’s funny because I don’t usually have that many problems with this kind of narrative but it really did make it harder for me to completely devour the book. There were just times I would drift off and then would have to re-read a page because I would have no idea what had just happened and that ultimately made it hard for me to give this book a higher rating. 1. )It is full of magic with every turn of the page. 2. )The names of the people, places, and things fit them just perfectly with extraordinary whimsy. 3. )The awestruck feeling I got when I read the first Harry Potter book I got while reading this book. I want to be a Luck Ugly! 1. )That this story is fictional, lol! It's been a while since a book pulled me through itself as rapidly as Paul Durham's The Luck Uglies. Lately, I've been reading a lot of material because I felt that I ought to, or needed to know about it, or required it for research. I have been wanted to get to The Luck Uglies since I first spotted Petur Antonsson's wonderful cover, but as time wore on, I was worried that it wouldn't hold up. I needn't have. The book starts beautifully--with a rooftop chase--and it's all uphill from there! Durha It's been a while since a book pulled me through itself as rapidly as Paul Durham's The Luck Uglies. Lately, I've been reading a lot of material because I felt that I ought to, or needed to know about it, or required it for research. I have been wanted to get to The Luck Uglies since I first spotted Petur Antonsson's wonderful cover, but as time wore on, I was worried that it wouldn't hold up. I needn't have. The book starts beautifully--with a rooftop chase--and it's all uphill from there! Durham has done a magnificent job constructing the fictional world of Village Drowning and has peopled it with a wonderful cast of characters. 11 year old Rye O'Chanter lives by a set of rhyming rules, rules which don't quite mesh with the law as laid down by Earl Morningwig Longchance. When Rye accidentally breaks one of hers, she has an encounter with a horrifying creature. It seems the Bog Noblins have returned! Unfortunately, the Earl has driven out the only group capable of defeating them, the mysterious and possibly criminal Luck Uglies. Rye sets off to learn about the truth about Luck Uglies, though the answers are closer to home than she could have predicted. I can't begin to say how much I loved this book! It was amazing, one of the best I've ever read. I new I'd like this book the first time I saw it a couple of months ago. But I was not expecting it to be this good, and for me to like it as much as I did. It has a marvelous beginning, well written and nicely thought out. It was cute, quite funny, and I loved the illustrations for each chapter. It had a good plot, a can't say I didn't like a character, and I thought it was just a wonderful world to step into. The author did a great job, he should be really proud, and I hope there are more, because I really didn't get enough of this book. And the ending was amazing! it was cute, kind of funny, and I loved every word. I can't think of a better ending for this book. I really can't say I found anything wrong with it. It was well written and well thought out. Maybe I was too caught up in the book to pay closer attention, but I don't have any problems with the book. Like I said, I honestly can't say I didn't like any of the characters, but I think Rye and Harmless were me favorites, and Nightshade Fur Bottom O'Chanter (A.K.A Shady). I love this book, and this is going to be the first time I have ever done this, or might ever do this again, but I'm going to give this book a 10. You really have to read this book! I picked up this book the other night for my son, the cover art looked just like something he would choose. He however is busy finishing a different book and I needed something to read so I began to read it...and finish it...in less than 24 hours. Yes, the laundry was calling to me but it could wait; I had to know what Rye O'Chanter was up to next! I love books that feel new but familiar all at the same time. I felt that way with Harry Potter, Fablehaven, Gregor the Overlander and now The Luck Ug I picked up this book the other night for my son, the cover art looked just like something he would choose. He however is busy finishing a different book and I needed something to read so I began to read it...and finish it...in less than 24 hours. Yes, the laundry was calling to me but it could wait; I had to know what Rye O'Chanter was up to next! I love books that feel new but familiar all at the same time. I felt that way with Harry Potter, Fablehaven, Gregor the Overlander and now The Luck Uglies. An easy but exciting and fun read with plenty of adventure, new ideas and characters. This charming middle grade is compared to Stefan Bachmann – The peculiar and I can see why. It has the same tone to it, with it’s mystery around the notorious group that is called ‘The luck Uglies.’ and the appearance of a dangerous beast. I think this book has a lot to offer to both adult as children. Rye and her sister grow up with a couple of rules to keep them safe from monsters, even when they are brushed away as scary bed time stories and rumors. Until Rye comes face to face with one of them, a Bog Noblin, and the whole village falls apart. There is only one hope for them and that is the return from The Luck Uglies. I quite liked Rye and I think she will make a good example for children. She listens to her mother, but she also shows that a little rebellion isn’t so bad. It shows that you also have to think for yourself and that it’s okay to make mistakes. She might be afraid of things, but she is brave enough to conquer her fears. This is how she starts an unique relationship with the mysterious ‘friend’ from her mother. It's quite obvious what his role is in the story, but that wasn't a problem to me. The writing-style is pretty youthful, but there was never a point where the story became childish; it made the book just very easy and quick to devour. It’s not a book I would buy for myself, but I still downloaded the sequel from Edelweiss. The mystery around the Bog Noblin and the luck Uglies was interesting enough to make me continue this series. I would recommend to read this one is you look for something entertaining that doesn't acquire too much attention. I loved it. There are gruesome goblins (not too scary) and awesome adventures to pull the reader along and develop the characters (whom I loved). The good characters are a little bad and the bad ones a bit good. The families are (almost all) solid and protective and reassuring (this may make it sound boring and it was NOT). Warm and fuzzy in some places and scary and exciting in others, in just the right combination. I can't wait for the next one. I normally don't read tween books, but this one caught my attention on our libraries website. I requested this along with 3 others. I have to admit. I really enjoyed this. Great action to hold a young adults attention and leaving them wanting more. I don't know if I will follow up with the rest of the series, but this is a great start. Bursting with adventure, charming fantasy elements, plucky characters, and irresistible wit, The Luck Uglies is a fantastically fun first book in Paul Durham’s debut middle-grade trilogy! Eleven year old Rye O’Chanter doesn’t really believe in the nasty, man-eating Bog Noblins...until she has a terrifying encounter with one. Now, Village Drowning is in danger from these devilish beasts, and their only hope may lie in their biggest outlaws: the Luck Uglies. 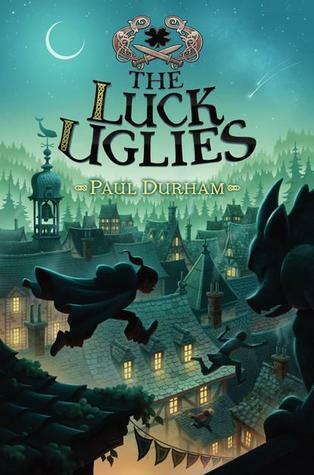 A band of rogue “criminals”, who saved t Bursting with adventure, charming fantasy elements, plucky characters, and irresistible wit, The Luck Uglies is a fantastically fun first book in Paul Durham’s debut middle-grade trilogy! Eleven year old Rye O’Chanter doesn’t really believe in the nasty, man-eating Bog Noblins...until she has a terrifying encounter with one. Now, Village Drowning is in danger from these devilish beasts, and their only hope may lie in their biggest outlaws: the Luck Uglies. A band of rogue “criminals”, who saved the village from the last Bog Noblin attack, the Luck Uglies have been banished by the greedy Earl Longchance. But with the appearance of a mysterious stranger called Harmless, Rye discovers there’s more to the Luck Uglies, Bog Noblins, and maybe even her own family. The Luck Uglies was such a delightfully exciting page-turner! Paul Durham has spun a wholly captivating and engaging story that young readers won’t be able to put down. Gruesome beasts, thrilling outlaws, secret tunnels, frightening dungeons, enchantments, oh my! This book has it all and then some! Fast-paced and full of breathtaking action and chills, this is an easy book to devour. Durham weaves together familiar fantasy elements, smart sparkling storytelling, and unforgettable characters to create something truly magical. With an enchanting voice and whimsical atmosphere, The Luck Uglies captures that special something middle-grade readers crave. Village Drowning appears, at first, like an ordinary medieval village, but holds many enthralling, surprising, and kooky secrets. With wildly fun street/store/place names and eccentric inhabitants, Village Drowning makes for a wonderful setting. I loved traversing the village’s streets (and roofs and hidden underground passages!) with Rye and her friends. In fact, she gets so much done in such a gung ho fashion, and proves to be s This book offers readers a very complex and capricious story line. It manages to couple just the right amounts of magic, whimsy, action, and suspense that great middle grade books need to both capture and cultivate the imaginations of younger audiences. "The Luck Uglies", is a fantasy for the child in all of us. Paul Durham's fantastical world has a great young female character, nasty villains, monsters, a little magic, an evil Earl and plenty of secrets and mysteries to discover. It's a perfectly splendid fantasy read. My daughter, who is not even a fantasy fan, loved this book. Most of the characters are not mere stick figures, but fleshed out people. Durham also pulls the reader along as his young character must unravel the mystery of her her "The Luck Uglies", is a fantasy for the child in all of us. Paul Durham's fantastical world has a great young female character, nasty villains, monsters, a little magic, an evil Earl and plenty of secrets and mysteries to discover. It's a perfectly splendid fantasy read. My daughter, who is not even a fantasy fan, loved this book. Most of the characters are not mere stick figures, but fleshed out people. Durham also pulls the reader along as his young character must unravel the mystery of her heritage and defeat a great evil. This is an adventure tale for middle school readers. When we first meet Rye O' Chanter, the young heroic female main character, she and her friends have are on the run on the rooftops of the Village of Drowning because they have stolen a special book, which tells the secret story of Drowning. Durham uses the tales in this book to fill in the back story of the novel. Its a good technique. Rye lives with her mother, sister and cat and a bunch of rules. One of which is never to let the cat our of the house -- maybe there is more to the cat than meets the eye. It is a time of trouble in the village. The evil Earl and his soldiers are flexing their muscle. The soldiers are threatening Rye's mother with special taxes. Then a young Bog Noblin, thought extinct, is captured and imprisoned by the Earl, who thinks he can keep the monster imprisoned. However this Bog Noblin is a mere baby. When the Bog Noblin's relatives come calling, the Earl and his troops will be faced with monsters twice as big and much more ferocious. The townfolk are afraid. When Rye was a young girl, the Bog Noblin attacked Drowning, but the Luck Uglies, a criminal gang fought them off in alliance with the Earl. But the Earl turned on the Luck Uglies and forced them into hiding. Now the peril to the town is dire and one of the Luck Uglies, a man Rye has befriended is in the castle dungeon. Rye must free him, open a secret door to the forest and use her wits and friends to save the town. The first book in a trilogy, this fantasy is dark and marvelously filled with monsters. Rye has grown up in the worst part of Village Drowning. Her mother owns a shop in the market section of town where Rye helps out. Together with her two best friends, Rye begins to piece together the story of her family and her father. It all has to do with the monstrous Bog Noblins, creatures that are considered extinct but that Rye is convinced have returned to the village. The problem is that the only peopl The first book in a trilogy, this fantasy is dark and marvelously filled with monsters. Rye has grown up in the worst part of Village Drowning. Her mother owns a shop in the market section of town where Rye helps out. Together with her two best friends, Rye begins to piece together the story of her family and her father. It all has to do with the monstrous Bog Noblins, creatures that are considered extinct but that Rye is convinced have returned to the village. The problem is that the only people who can defend the village against the monsters are the illegal Luck Uglies, a troupe of villains who had been driven from the village and are considered just as evil as the monsters. But all is not what it seems in Village Drowning as Rye is soon to discover. Durham has crafted a fabulous fantasy for middle-grade readers. The book is filled with moments of real fear and true danger, making it ideal for that age. It also has plenty of humor along the way, usually involving Rye’s friends and family, allowing a lightness in the novel that is very appealing in such a dark novel. Durham has created a world in this book that is unique and fascinating but also pays homage to more traditional tales. This book slips neatly into European tales of monsters and goblins, yet still manages to be telling its own story. Rye is a wonderful heroine. She is bright and inquisitive and immensely brave particularly when someone she loves is in danger. At the same time she is fully human, frightened at times, holding on tight to her own viewpoint, and learning to trust too. She is certainly not without flaws, but she is immensely likeable and exactly the person you want when the Bog Noblins return. Dark, dangerous and delightful, this book is a strong new fantasy series for middle-grade readers. Appropriate for ages 9-12. Another great fantasy series for middle grade readers, The Luck Uglies starts with a bang as Rye, the main character debates the risks of jumping from roof to roof only to be frightened into it by a moving gargoyle. Rye is an appealing main character with appropriate strengths and weaknesses. I especially appreciated how she's not an athlete, in fact she's a bit clumsy, especially on rooftops. Rye's strength is her determination to help those she cares about. But she makes her share of mistakes, Another great fantasy series for middle grade readers, The Luck Uglies starts with a bang as Rye, the main character debates the risks of jumping from roof to roof only to be frightened into it by a moving gargoyle. Rye is an appealing main character with appropriate strengths and weaknesses. I especially appreciated how she's not an athlete, in fact she's a bit clumsy, especially on rooftops. Rye's strength is her determination to help those she cares about. But she makes her share of mistakes, such as sneaking out on the Black Moon which leads to an encounter with a supposedly extinct Bog Noblin. As Rye struggles to understand the numerous rumors about Bog Noblins and the Luck Uglies who fought them in the past, she discovers that family secrets play a much larger role in the whole mess than she could have ever imagined. I liked the fact that Rye has a great mother who supports and protects her, despite keeping some rather important secrets. So many books of this type revolve around orphans that its rather refreshing to read one where the whole family is important. Yet Rye makes her own choices both good and bad in facing the possible destruction of everything she knows with a variety of consequences. **I love Rye, the smart and brave heroine of the story. **I love the dynamic between her and Harmless. The moments between the two of them were some of the best in the book. The epilogue gave this book just the right ending. **It was refreshing to see that many of the characters were not really all good or all bad. It was easy to feel empathy for most of the characters in the book, even some of the really bad ones like Malydia. **I love the unique lore and legends that fill this book and look forward to seeing how these things play out in the next books. **I can't wait to see what happens with Rye, Lolly and Quinn and their "special abilities" in the next two books. We are definitely looking forward to the next two books in the trilogy and would highly recommend this series to tweens who love adventure. A word of warning though...this may not be a good choice for children who are sensitive to violence. There are some gory battle scenes described with the Bog Noblins (Think Lord of the Ring Orcs). In short, the Bog Noblins enjoy devouring humans and wearing necklaces made from their feet. The author doesn't go into too much detail but knowing this certainly increases the level of suspense. The Luck Uglies, by Paul Durham, is a fantasy adventure whipped up and served with charm, humor, and excitement. Rye O’Chanter, an eleven-year-old girl, lives with her family in Drowning, a village ruled by the arrogant and cruel Earl Longchance. But Longchance isn’t the only threat to Drowning. Terrifying monsters known as Bog Noblins are a danger, too, and only The Luck Uglies, a secret society banished from the village, are capable of stopping them. When a Bog Noblin called Leatherleaf ventures The Luck Uglies, by Paul Durham, is a fantasy adventure whipped up and served with charm, humor, and excitement. When a Bog Noblin called Leatherleaf ventures into Drowning, villagers are split between wanting The Luck Uglies’ protection and calling on Longchance for his help. Amid the chaos, Rye discovers secrets surrounding the history of Drowning that lead her to believe not everything is as it appears. This book was a fun, easy read reminiscent of The Three Musketeers. Durham does a bang-up job with world building. With names like Old Salt Cross, Mud Puddle Lane, and Mutineer’s Alley, readers will be hard-pressed not to be completely immersed in Village Drowning. Durham also introduces a cast of delightfully rounded characters that all have a definitive role throughout the story. Rye is a strong, willful, and vibrant character who carries the adventure over rooftops, through bogs, and into graveyards, never losing our need to know what will happen next. thought it was well written and I enjoyed reading. I originally entered the contest expecting my daughter the perfect age for the book would love it. For some reason, the title and cover though I think more the tittle bothered her. I am sure this would have pleased the Earl. I really liked the main character, she was fun. Her family was also enjoyable and I really liked her interaction with Lottie. There is quite a lot going on and multiple bad creatures/villains. I liked Rye's friends, they didn't take up to much of the story but were fun when with Rye. I read the book pretty quick which is more than not a sign I enjoyed it. My only issues would be that I guessed early on many of the things that were to happen, maybe a little to early to enjoy each of these twists. Of course I quite older than the intended audience and at that age they might be less obvious. I felt the book was a good size but possibly the last couple of chapter could have been longer and maybe cutting a little in the beginning if the book was to big. That said I enjoyed the book s good deal and was never bored with the amount of action. There are books we all hope to find that do more than simply tell a story. These books take us with them. They take us with them on the adventure and we feel like we know the world around us when we go. And these are rare treasures we keep and pass along. Author Paul Durham’s first MG/YA novel, The Luck Uglies, is one of those rare books. An adventure and an introduction to Village Drowning and all its inhabitants, The Luck Uglies has a timeless feel, as if it might just as believably come from t There are books we all hope to find that do more than simply tell a story. These books take us with them. They take us with them on the adventure and we feel like we know the world around us when we go. And these are rare treasures we keep and pass along. Author Paul Durham’s first MG/YA novel, The Luck Uglies, is one of those rare books. This debut fantasy adventure has a strong heroine and plot that trots along before finding it's stride. The fantastical setting came across as a mix of British and Medieval times. The town is under the protection of an evil Earl with a corrupt Constable. A stone wall surrounds Village Drowning like a feudal city. Luck Uglies used to guard the village until the Earl banished them. Bog Noblins live in the nearby swamp and when they start to attack the townspeople, the Earl struggles with their siz This debut fantasy adventure has a strong heroine and plot that trots along before finding it's stride. The fantastical setting came across as a mix of British and Medieval times. The town is under the protection of an evil Earl with a corrupt Constable. A stone wall surrounds Village Drowning like a feudal city. Luck Uglies used to guard the village until the Earl banished them. Bog Noblins live in the nearby swamp and when they start to attack the townspeople, the Earl struggles with their size and power. He refuses to call for the Luck Uglies help making Rye dig into the past to find the history of the rift. She discovers not only the town's history, but her family's as well. While the start is somewhat choppy, it comes together at the end with some interesting plot twists and action galore. The first line has a good hook with Rye, the protagonist, commenting that she and her two friends never intended to steal a banned book. The three are running from rooftop to rooftop with the book owner chasing them, when Rye sees a gargoyle move and stumbles off the edge of the roof. Clothesline break her fall and she ends up at the feet of Mrs. O'Chanter telling her to pull her dress down and stop showing the neighbor's her business. Mrs. O'Chanter is Rye's mother but her lack of concern and internal dialogue of where Rye calls her "Mrs. O'Chanter" versus "mother" made me think that Rye was an orphan. Then when Rye describes how different her sister Lottie looks from her and Mrs. O'Chanter, I wondered if both were orphans taken in by Mrs. O'Chanter. It becomes clear later on but I was confused by Rye's internal chatter. The next chapter jumps to Rye cleaning up and going to her mother's shop. I thought Rye's friends would have followed up to see if she survived her fall or if the man chasing them would demand his book back. I also wondered why Rye never told her friends about the moving gargoyle. Her character is painted as one that doesn't keep secrets from her friends. Once the action in the chapters flowed into each other as the story progressed, I got less turned around and had less going back to reread sections seeing if I missed something. The leap in some scenes sometimes left me feeling like I was falling off a rooftop. I lost my vertigo when the cat escaped and the Bog Noblin showed up in the plot. The author does a good job using humor to lighten the dark spots. When the Constable is demanding money Rye tries to tell him her name. He mispronounces it and she tells him ironically that it rhymes with "lie." When her mother frowns at her she picks a worse rhyming word, "die." When she meets the man with tattoos and battle scars all over his body she calls him, "Harmless." The House Rules that Rye goes by are rhyming couplets and she intentionally breaks them over the course of the novel. This reinforces her emotional arc of learning to think for herself. She also wears her father's boots that are too big for her making her trip at inopportune times. They show her trying to walk in his footsteps and become independent while making the reader laugh at the same time. Rye gets annoyed with her mom for not telling her the truth. Later her mom explains that her lies were meant to protect Rye. Sometimes adults can't tell children facts because they know they are too young to keep quiet. Rye understands this and shows how she is growing more mature as the novel progresses and she overcomes evil. The Bog Noblin is prejudiced by others in the community and Rye wonders about the justice of him being imprisoned. She is questioning authority and decisions; something she does repeated throughout the story. She is not a blind follower and tries to sort through oppressiveness whether it is with individuals or regimes. The layered themes make this story interesting and the action is nonstop in the middle and end. I will definitely be purchasing book 2 for the library. Rye O'Chanter is a young girl living in the village of Drowning. She lives with her mom and little sister Lottie. On the night of the Black Moon, Rye does the unthinkable, she leaves her house to sneak off to her best friend's home, the Dead Fish Inn. While scuttling about she comes across a monster long thought to be extinct, a Bog Noblin. Frightened, Rye runs, and only the magic of the necklace her mother gave her saves her life. But, what can she do for the rest of the villagers? A long time Rye O'Chanter is a young girl living in the village of Drowning. She lives with her mom and little sister Lottie. On the night of the Black Moon, Rye does the unthinkable, she leaves her house to sneak off to her best friend's home, the Dead Fish Inn. While scuttling about she comes across a monster long thought to be extinct, a Bog Noblin. Frightened, Rye runs, and only the magic of the necklace her mother gave her saves her life. But, what can she do for the rest of the villagers? A long time ago a secret organization, The Luck Uglies, saved her town from the Bog Noblins, but they are now considered outlaws and villains. 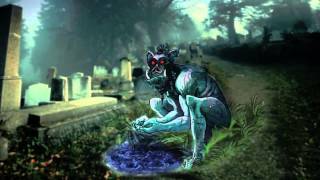 Rye begins hunting through clues from years past, and uncovers many secrets people wished would have remained buried. Soon, Rye begins to wonder, were The Luck Uglies really bad people or were they heroes? She desperately wants to save her people, but can she find away to bring back the long lost Luck Uglies? This book is such a delight. I enjoyed the build up as Rye learns about The Luck Uglies and their true history. Even funner is the fact that Rye's mother knows the truth, but instead of telling her family, she uses old magic to keep them safe. Everything about the story pricked my imagination and urged me on. I couldn't put the book down. Rye herself is a strong little girl that doesn't back down in a fight. She is brave and often chooses the unsafe path if it will bring about what is right. What fun to follow her adventures. She has two best friends, Quinn and Folly. They both are integral characters that compliment Rye and help her grow and find her path. There is also a good strong theme of family. As Rye learns secrets about her own, you see the true depth people will go to for the ones they love. I really loved Folly's family. She is the only girl in a horde of boys, and they stick together no matter what. Do you ever start a book and, after just a few pages, know how magical it’s going to be? THE LUCK UGLIES cast its spell on me early on, and I fell head over heels for the world, characters, and writing. The premise is insanely cool, mixing creepy creatures, nontraditional families, adventure, and secrets galore into an awesome package. Rye’s home, Village Drowning, comes to life as Rye and her friends navigate the mysteries behind it, and the story leaves plenty of hints of other unique towns an Do you ever start a book and, after just a few pages, know how magical it’s going to be? THE LUCK UGLIES cast its spell on me early on, and I fell head over heels for the world, characters, and writing. The premise is insanely cool, mixing creepy creatures, nontraditional families, adventure, and secrets galore into an awesome package. Rye’s home, Village Drowning, comes to life as Rye and her friends navigate the mysteries behind it, and the story leaves plenty of hints of other unique towns and villages that might be explored in later novels. Rye is a dynamic, clever, and brave protagonist, and the depth of the secondary characters takes the story to the next level. The descriptions and sly smirks from Rye’s mom, Abby, and the mysterious Harmless make me want prequel books dedicated to all of them. Rye’s friends, Folly and Quinn, also hold personalities that will draw the reader in. The dialogue between all the characters feels real, witty, and contains so much beneath the surface of what is being said. The plot unfolds beautifully, though the story line does get a tad slow in areas. When it slows down, however, the story opens up to wonderful relationship development between the characters, and the magic of the story continues to deepen. I especially love the balance between teamwork and individual capabilities that happen while attempting to solve the main conflict. Middle grade readers should flock to this series immediately. Those looking for magical writing brimming with complex characters and true heart will very likely find their next favorite book with this first installment in Paul Durham’s THE LUCK UGLIES series. Loved loved loved this fantasy set in a time reminiscent of feudal England. Rye and her family are poor subjects of a tyrannical Earl, there are creatures called Bog Noblins that terrorize the village, and others called Luck Uglies who have protected them in the past. The action is wonderful and engaging. Writing is equally wonderful. And there are big ideas that kids should think about inserted throughout the story, e.g. "it's easy to welcome something when you think it might benefit you" (even t Loved loved loved this fantasy set in a time reminiscent of feudal England. Rye and her family are poor subjects of a tyrannical Earl, there are creatures called Bog Noblins that terrorize the village, and others called Luck Uglies who have protected them in the past. "She'd been thinking about monsters. What was a monster?" The villagers have to wonder at several points who the real monster is - the bog noblins or the earl, who suppresses truth and oppresses the people. Charms, potions, creatures who aren't what they appear to be abound. The characters who should be are endearing. Rye's family origins are secret but finally come to light. And I look forward to the sequel. THE LUCK UGLIES by Paul Durham is one of the books you may have missed earlier in the year with the spring flood of new offerings. With the second book in this popular new middle-grade fantasy adventure trilogy coming out in March 2015, it’s time to catch up! With elements of mystery, adventure, and monster thrills, tweens will quickly become absorbed in this fantasy world set in a medieval-style village. Both boys and girls alike will enjoy the intelligent writing and engaging characters. The sh THE LUCK UGLIES by Paul Durham is one of the books you may have missed earlier in the year with the spring flood of new offerings. With the second book in this popular new middle-grade fantasy adventure trilogy coming out in March 2015, it’s time to catch up! With elements of mystery, adventure, and monster thrills, tweens will quickly become absorbed in this fantasy world set in a medieval-style village. Both boys and girls alike will enjoy the intelligent writing and engaging characters. The short chapters move quickly as the story builds to an exciting climax that involves intriguing monsters and a mysterious secret society. Not your typical “good vs evil” storyline, this book will appeal to young readers who are beginning to explore the layers of life, power of secrets and fear, and the fine line between hero and villain. Fans of Holly Black, Rick Riordan, and Brandon Mull will all enjoy this fantasy trilogy. To learn more about the author, go to http://www.pauldurhambooks.com/. Check out the book trailer at http://youtu.be/vTEUX8JzRhc. I've made quite an effort, but I can't sustain enough interest in this to keep reading, even though I'm less than 100 pages from the end. The writing style is pretty good, and the author has gone to a great deal of trouble to populate and decorate a lively olden village where magic and malice cross paths. Sometimes I think it's the pacing -- I wait and wait for something to happen. But then when something finally does happen, I don't seem to care. Midnight adventures, smart humor, a richly imagined otherworld, and winsome characters - LUCK UGLIES has the perfect ingredients for a spell-binding read. Rye is the kind of girl eleven-year-old me would have wanted to be friends with, and I fell in love with her darkly fantastical world in the first chapter. If you are lucky enough to pick up this book, prepare for a wild ride. Paul Durham was raised in Massachusetts and attended college and law school in Boston. He now lives in New Hampshire with his wife, two daughters, and an enormous, bushy creature the local animal shelter identified as a cat. He writes in an abandoned chicken coop at the edge of a swamp and keeps a tiny porcelain frog in his pocket for good luck.